In December, I went to Art Basel at the Miami Beach Convention Center not only to see contemporary and fine art but also to find out why billionaires, celebrities, artists, and regular people flock to this huge art show every year. Art Basel, which this year featured 267 international art galleries, is the place to go to enjoy great food, view contemporary and traditional art, watch people, and if you can afford it, purchase paintings and sculptures. The show was very crowded, especially on the last day, and also financially rewarding for many artists and galleries. Many of the sales were for pieces between $50,000 and $300,000, but several million-dollar sales were also made, including an oil on canvas painting, “Man in Blue VI” (1954) by Francis Bacon. The asking price was $15 million. A Picasso was also sold, “Buste au Chapeau” (1971) with an asking price of $10.5 million. In addition, many sales were made in the $5,000 – $10,000 range. Although $10.5 million might sound expensive, Picasso’s 1955 painting, “Les Femmes d’Alger (Version ‘O’) was sold last year for $179.4 million at Christie’s auction house, which was a record high. And billionaire collector Liu Yiqian paid Christie’s $170.4 million for Modigliani’s “Nu couche.” (1917). Art Basel only allows works created after 1900, and Hammer Galleries exhibited two of the earliest works at the fair: Picasso’s Danseuse espagnole (1901) and a rare Matisse, Le guitariste debout (1903). The two artists had a friendship that lasted a lifetime, but they also competed with each other artistically. Each recognized the other as his only true rival and as his greatest measure of success. 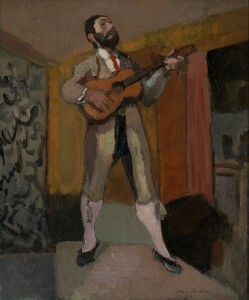 Additionally, the 1903 Matisse (shown below) was originally owned by Vollard. After Vollard was killed in a mysterious car crash, it later entered the possession of Vollard’s young Croatian assistant, Eric Slomovic. Slomovic stored this painting and hundreds more in a bank vault in Paris. After Slomovic died during WWII, the paintings remained in the vault for 40 years. When a painting such as this has not been seen on the market for decades, it is much more desirable for buyers. After all, even billionaires like a good story. One group of people, billionaires, are especially keen on collecting art, which is why so many attend Art Basel. John Mathews, head of Private Wealth Management at UBS Wealth Americas, explains. “Art Basel is one of our main events because it’s important to our clients,” he said. “Many are avid collectors or are inspired by art.” UBS has been a long-time supporter and collector of contemporary art. They are the global lead partner of Art Basel. Do billionaires invest in art like they do stocks and bonds? “When we put together asset allocation models, we don’t include collectibles like art,” Mathews said. “It’s hard to put a value on art because there is no daily market value like a stock. The wealthier you become, collectibles become a substantial part of your overall net worth. Real collectors buy art because they like to look at it and enjoy it and are passionate about it.” They also like to show the work to their friends and family and often decorate their houses with the purchased pieces. At Art Basel, I spoke with gallery owner Xavier Hufkens, who pointed out that buying art was not just about making money. “People buy art because they love the work, not just for investment,” he says. “I love to be surrounded by art. That is how I understand the world. I explain to buyers who the artist is, the history behind the work, and why I like it. One of my jobs is to help people learn how to appreciate art. To me, art is slow attention. It takes time to appreciate the work.” Learning about the history behind the painting is an important part of the process. By the way, although there were record-breaking art sales last year, overall sales in the art community have slowed from previous years. It’s too early to say why, although some experts say that some of the buying reached near bubble proportions. I highly recommend attending Art Basel in Miami Beach in 2016 (it’s always in December). The fun isn’t only at the Miami Beach Convention Center (where the main event is held). All week, there are parties, concerts, and art events in Wynwood, an area of Miami where most of the galleries are located. If you are an international traveler, you can also attend Art Basel in Basel, Switzerland (in June) and Hong Kong (in March). Attending exhibitions and viewing fine art is one way of escaping reality while being entertained.